I remember when proposals to legalize gay marriage were thought of as radical and way out on the fringe of suggestions for adopting as planks in the Democratic Party platform. Forward just a few decades to now and Democratic Governor Christine Gregoire feels Washington State is ready to legalize gay marriage at the state level. I'll have to hand it to the gay rights movement. Gay rights may be the most successful social cause that has been associated with left leaning politics. Picture from Wikimedia Commons. 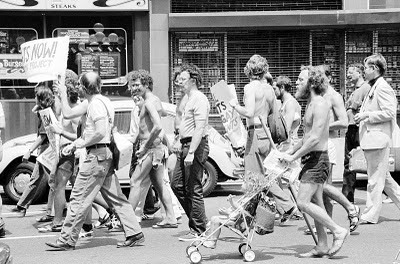 Gay rights demonstration 11 July 1976 at the Democratic National Convention, New York City. Leffler/Library of Congress via pingnews. Washington has had domestic partnership for gay and lesbian couples over the past few years. Sometimes called the "everything but marriage law," but now we may be ready for that next step; calling it marriage. A few states have already taken that step and most importantly the whole nation of Canada has legalized gay marriage both at the provincial and national level. What has happened to other causes brought up at various Democratic Party conventions over the decades? For many years, people have been marching for world peace. Are we any closer now than we were in say, 1976? What about reducing our carbon footprint? Many a conference on global warming has come up with resolutions, but has the footprint actually been reduced? How about fairness of income distribution? Especially in American society? Are common people getting a better deal than say in 1976? Many would answer no, but in spite of what has seemed like gridlock over the years, the gay movement continues it's gradual progress. How can this be, when it was thought of as one of the most fringe of the causes, not that long ago? Gay rights advocates deserve some pride for their successes. At the same time, one does have to wonder why other causes have been stuck in neutral all this time. Besides gay rights, it seems like the most obvious progress being made in society is on the technological front. Back in the 1970s, no one had Smart Phones, access to Google or web sites. Technology keeps marching forward though some would say more technology is not necessarily progress for the better. At the same time, of course, there are some who say that progress toward gay rights is not really for the better either. There are still folks adamantly opposed to things like legalized gay marriage. Even within the gay community, itself, there are some who miss the days when gay life was more clandestine; more underground. They would say it had more color back then. There is the famous comment that goes, "Promoting marriage among gays?" "Haven't the gays suffered enough as it is?" This implying marriage isn't really all that great. Personally, I'm not a big fan of the concept of traditional marriage, but I am in favor of fairness and equality among both gay and heterosexual folks if they do wish to get married. As for some of these other causes, like low carbon footprint or peace in the world, I don't know what's holding us back. Around the edges, maybe we can say progress is being made. Contrary to popular opinion, the rate of violent crime is actually dropping, according to recent crime statistics I've been reading. That's the rate of violent crime on a per capita basis, here in USA. Maybe that's a sign of progress toward more peace in the world. In other causes, such as lowering the carbon footprint, it seems like some progress is being made behind the scenes, if nothing else. The technology for more efficient solar collectors is on it's way; so they say. Bike paths abound, throughout Bellingham at least, but its hard to say if use of these paths has gone "mainstream" or not. Speaking of bike paths, another metric for measuring social progress could be in looking at the health of the population. After years of "wellness programs" are we any healthier than before or are things like obesity and diabetes on the increase? Sometimes it feels like we're just running no place in a squirrel cage. Obesity seems to be on the rise, but at least less people are smoking. Maybe there's some progress. Fairness of income distribution is really a tough one. Seems like society is just going backwards on that, but the descent into "income gap hell" is not as pronounced as one might think. Technology comes to the rescue again. At least poor people now can have access to things on the Internet that even the wealthy couldn't have dreamed of enjoying decades ago. Gay rights advocates deserve some pride for their successes. I thoroughly agree, and would like to add something that's oft overlooked. The gay community came to terms with itself. Some say it "grew up," others say the AIDS crisis forced it to re-evaluate priorities. I don't care what excuse is used. I can remember being shunned and castigated for being a parent, that was practically worse than being a PWA. The stereotypes were embraced - I knew several men who would never dare admit they liked to watch football. The list goes on. Like the movement itself, there were pioneers in the community who demanded to be treated for who they were, not who they were "supposed" to be. I like the changes. Now, the hiking club coexists alongside the drag communtiy. The fear of parenting has evolved into the joy of parenting. These are but a few examples. I think a lot of these internal changes solidified the foundation on which we stood when lobbying for societal changes. Now here we are, slowly but surely achieving marriage equality. Forward! There is still much to be done within our community. Transgendered people still face terrible obstacles, both from within and without our community. Elderly gays, disabled gays - we still have a lot of work to do.